Anger camera the original form of gamma camera. Because the Anger camera is by far the most frequently used type of gamma (or scintillation) camera today, the terms are often used interchangeably. gamma camera (scintillation camera) an electronic instrument that produces photographs or cathode-ray tube images of the gamma ray emissions from organs containing tracer compounds. The original and most commonly used version is the Anger c.
any one of several scintigraphic cameras that simultaneously record counts from the entire field of view. 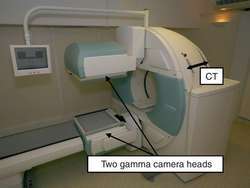 A camera used in medical diagnostic imaging that tracks the distribution of radioactive tracers in body tissues. a device that uses the emission of light from a crystal struck by gamma rays to produce an image of the distribution of radioactive material in a body organ. The light is detected by an array of light-sensitive electronic components and is converted into electric signals, which are processed to produce the image. The gamma camera is a workhorse of nuclear medicine departments, where it is used to produce scans of patients who have been injected with small amounts of radioactive materials. Any one of several scintigraphic cameras that record simultaneously counts from the entire operative field of view. A device consisting of a large crystal of a material that produces a tiny point of light where it is struck by a gamma ray. Between the crystal and the subject is interposed a thick lead plate drilled with numerous parallel holes (a collimator) that ensures that only parallel rays strike the crystal. In this way an image is formed on the crystal corresponding to the pattern of gamma rays given off by the subject. The gamma camera is used in conjunction with selective radionuclides that concentrate in certain parts of the body, such as the bones, the thyroid gland or a tumour. See also RADIONUCLIDE SCANNING. A camera, somewhat like an x-ray machine, used to photograph internal organs after the patient has been injected with a radioactive material. At 26 cm gamma camera also shows the linearity behaviour with variance 2. We found that CardioMD image quality is equal to and at times better than larger field of view gamma cameras when we have imaged patients with both systems," said Gary Heller, M.
Digirad's wholly owned subsidiaries, Digirad Imaging Solutions and Digirad Imaging Systems, offer a comprehensive, mobile imaging leasing and services program for physicians who wish to perform in-office nuclear cardiology procedures but do not have the patient volume, capital or resources to justify purchasing a gamma camera. The contract is for the supply, assembly Gamma Camera Spect CT and planar gamma cameras for the needs of the Department of Nuclear Medicine, the Multi-Regional Hospital in Gorzow Wielkopolski Sp. 443 / 14 purchase, delivery, installation and commissioning of a rotary-head gamma camera coupled with a helical ct scan multi-layered. Their head office had purchased 10 gamma cameras out of which they would get one. DDD, based in Hoersholm, Denmark, develops, manufactures and markets gamma cameras for scanning heart, kidney and cancer patients. Digirad Corporation develops, manufactures and markets solid-state, digital gamma cameras to hospitals, imaging centers and physician offices. Contract notice: Rx Scanners, Imagers Magnetic Resonance (Irm), Gamma Cameras, Scanners Positron Emission (Tep) Coupled To A Rx Scanner, Emission Tomographs Tomography (Tep) Coupled With A Magnetic Resonance Imager (Irm) And Associated Services Execution. The specific product segments analyzed are Gamma Cameras, and PET Scanners.